All programming must be non-commercial. A User Access Form must be filled out for each program. All individual programs must be labeled. GCTV will not broadcast programs that do not meet these criteria. Who Can Submit a Program? Any resident or employee of the 7 town cable franchise area (Guilford, Madison, Branford, North Branfford, North Haven, East Haven and Wallingford) may submit programming to air on one of our 3 channels. Producers under 18 years of age must have a parent/guardian sign the User Access Form as the submitter. GCTV writes the program schedule on Tuesdays and Thursdays for new program cycles to begin at 12:01am on Sundays, Wednesdays and Fridays. Programs are scheduled using the following guidelines. New Guilford produced programs are scheduled first. Repeat Guilford produced programs are next. New non-Guilford produced programs are third. Repeat non-Guilford produced programs are last. Download our full set of scheduling guidelines here. 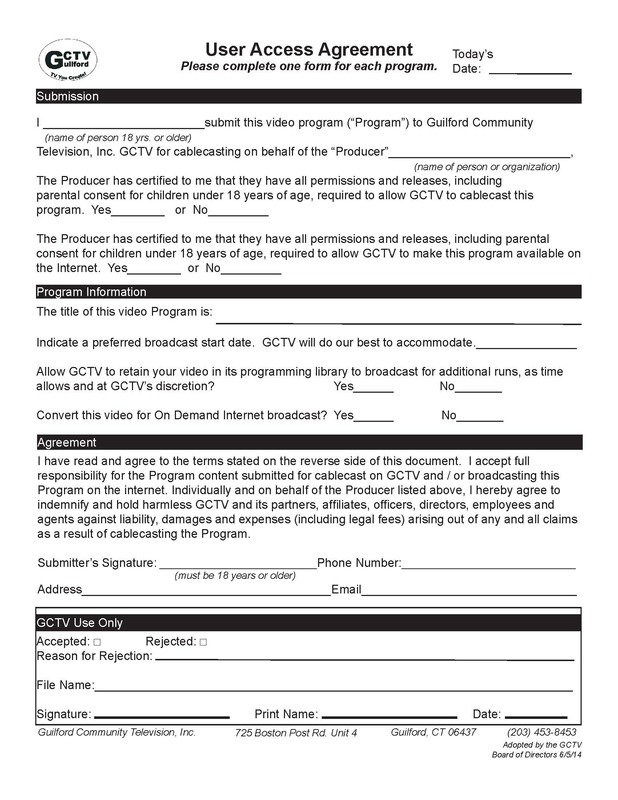 All producers and submitters of program content are subject to GCTV's Policies and Procedures.